So intrigued by there questions I wanted to find out more and seeing if I should be buying agave nectar after all… first step was to speak to the people in the know that brought Agave Nectar to the UK. So is Agave Nectar an artificial sweetener in disguise? “Thank you for your email. We do in fact know your site and really love it! It is a fantastic support for people with food intolerance’s and I myself have recommended it to many people…. We have also been delighted to see our Agave recommend on the site. We also get some customers saying negative stuff about the agave….much of it taken from some American websites. We are still quite a small company but began bringing Agave Nectar into the UK from Mexico in 2006. It has long been a well known and very popular product in the US and we have been able to make it available in the UK and it really has taken off. 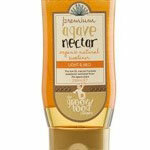 The Groovy Food Company’s Agave Nectar is an excellent natural alternative to sugar and artificial sweeteners. It is completely pure, organic, unrefined and free from any processing chemicals. It is lower in calories than sugar and 25% sweeter so less is required to gain similar sweetness to sugar. Importantly, our Agave Nectar has a very low glycaemic index due to its high proportion of natural fructose. Subsequently, it is an ideal sweetener for those with special diet considerations or who monitor their glucose intake. With its very low glycaemic index level it keeps blood sugar levels balanced so there are no highs and slumps associated with sugar, honey or other syrups. We have had a great deal of positive feed back from people who suffer from diabetes and are now delighted to have found a sugar and artificial sweetener alternative that they can enjoy. I so find it incredible that people are comparing artificial sweeteners with Agave. They need to look closely at the chemicalized manufacturing processes of producing artificial sweeteners and also the very disturbing long term health problems that are linked to using artificial sweeteners before comparing with a natural and organic product such as Agave. Some of the negative feed back we have had relates directly to an American online magazine article which has been copied and pasted by many other sites, without any back up information or actual research into the validity of the claims. We have only had a couple of enquiries about this article which I do suggest you take a look at…you may have come across it. its at http://www.naturalnews.com/024892.html. We have put together a ‘standard’ answer to deal with queries about the article which even the editor of natural news explains is controversial and not necessarily their opinion. Please do read the article and then carefully our answer to it, which has been put together after a great deal of research. It seems that natural Agave nectar is being mixed up with high fructose corn syrup and this is where problems are arising. I felt if you saw our standard answer, it may help you to answer any queries you may get too. We are aware of this article and a couple of others by the same authors that are being copied on to many US websites, unfortunately without much back up research. As the Natrual News Editor does point out, they do not agree entirely with the statements and are mainly concerned about some of the very low quality agave present in the US market place in an increasing amount. In the US, where Agave has for many years remained one of the most popular alternatives to refined sugar and artificial sweeteners, there has recently been negative press concerning Agave Nectar and it has been proved many times that the source of these complaints are in fact often made by companies and individuals with conflicts of interest, often aligned with competing products. Please be assured that these claims are well balanced by the increasingly large number of websites claiming the virtues of Agave Nectar. Our Agave Nectar is the product of the organically grown Blue Webber Agave Plant in Mexico. After harvesting, the large pineapple shaped core of the plant, known as the pinas, is crushed and milled. All raw juices are collected. The juice then undergoes a process of filtering to various levels to produce the Rich Agave Nectar and the Mild, the mild being filtered for longer. The filtered product then undergoes hydrolysis, gently heating the juice to a maximum of 161 degrees F (70-72 degrees C). This is the final stage in the production of the Agave Nectar. We do not claim ours to be a ‘raw’ product. We have visited the manufacturer in Mexico and seen for ourselves the high standard of the manufacturing process which allows us to confidently import the product into Europe. The organically grown Agave plants are cultivated and produced without the use of chemicals or genetic modification. At no stage of the manufacturing process is the Agave juice either refined or exposed to or treated with chemicals. The Agave Nectar is produced organically and certified by a European recognised body. The product has full traceability. For every batch produced we receive full certificates of analysis and samples for approval. We also ourselves independently test these samples with an accredited UK based Analytical Consulting Chemist. We must emphasise that we only import from accredited organic suppliers in Mexico and we are therefore unable to comment on websites that make claims about the manufacturing processes undertaken by non- organic producers . There is a great deal of negative press surrounding fructose but this is the fructose found in High Fructose corn syrup, manufactured using chemical processes and high refining. Agave Nectar fructose is completely different, ours being organic and natural manufactured without the use of any chemicals or refinement. They are very different products but increasingly Agave Nectar is being linked and confused with High Fructose Corn Syrup. We have also heard about several US companies buying Agave in bulk and ‘watering it down’ with high fructose corn syrup. Concerns about the consumption of fructose have grown steadily over the years due to the increasing amount of High Fructose Corn Syrup that is now increasingly used by the food industry, especially in the US. It is a highly refined chemically produced sweetener used in most fizzy drinks and processed foods. Its addition to so many products has lead to many receiving very high doses of High Fructose Corn Syrup on a daily basis. We are unable to comment on the effects of High Fructose corn syrup as it is not a product we would ever include in our foods and it would be unethical for us to make any negative claims. However, it is unfortunate that such a refined fructose is so often confused with a natural organic syrup that has long been used in moderation as a sweetener. Critics of the article you sent us have also claimed that the comments made by the authors, follow laboratory testing which involved massive doses of pure clinical fructose being fed to rats regularly. This is not the same as the normal moderate daily use of agave nectar in the course of our meals. Our Agave Nectar is a natural and organic product which is completely free from chemicals and refinement in the manufacturing process used in its production. Although high in natural fructose, it is an excellent alternative to refined sugar and artificial sweeteners. It has a very low Glycaemic Index and is a slow release carbohydrate which will keep the blood sugar levels balanced and allow the body to absorb it slowly, avoiding the usual sugar rush we associate with sugar, which allows its use by diabetics. Agave Nectar is a sweetener and ideally used in moderation and not in very high doses. Phew that’s your lot – love to know what you all think. For what’s it worth I go by what my body tells me, I get no highs or lows when using Agave Nectar (which I do when using sugar), I love the taste and when used in moderation to avoid sugar I think its great, so I will still buy Agave Nectar when I am next in the supermarket. I totally agree, Agave is an amazing product and has been a life saver for me (Yeast intolerance). I am always raving on about agave. I have a yeast intolerance and thought that anything sweet, including fructose, just feeds the overgrowth of yeast. I can’t understand why Agave would be any different. I read the articel but from what I have read myself the Groovy agave is made by Iidea one of the two large companies named in articles the other being Nekulti who make the vast majority of agave products for people under their own labels. Iused to buy Groovy agave and it says it on the old bottle. I am a big fan of Dr Mercola and he has recently published a warning against using it which is good enough for me. I do know that fructose no matter where it is from has the same effect on the body a negative one so blaming high fructose corn syrup isn’t relevant. You are better off using natural alternatives such as honey which has about 40% fructose or Sweet Freedom which has 25% http://www.sweetfreedom.co.uk (think you should make it clear that Sweet freedom is natural and not chemical which is implied by their reply) as opposed to agave that has 90%. I also have relatives in Florida who used to use agave (it was always way more popular there than here) but they say now that Americans have all turned against it. I have also tried using xylitol but don’t find it very sweet at all. I have to say I agree with Tracey in that the issue is about fructose rather than agave itself and it is a little disappointing that the manufacturer didn’t address this iquestion. It is obvious that a better quality agave is better than a low quality one, but agave has a high fructose content full stop. That said, I don’t think we can’t have any. I like it and use it, just as usual: everything in moderation. I have just posted about the whole fructose thing on my patient blog too so check it out if you like. I was researching it for a patient question and came across your site – thanks! Hi Miranda, I noticed you wrote about algave syrup and at the bottom of your blog read that you will continue ‘to buy it to avoid sugar’. Just to inform you – fructose is sugar! Sugar is the name for all substances that break down to glucose in the body, including sucrose, lactose, and fructose. Also starches break down to glucose. The issue is not whether it is a sugar or not, but how quickly it breaks down to glucose. Fructose takes rather longer than sucrose and is therefore better for people who have a blood sugar problem. Hope this clears up the misunderstanding. Ounce for ounce all sugars provide the same number of calories. If it tastes sweeter and you need less, you’re obviously saving calories and making less glucose. The article in the link appears to have gone, but I found one that made similar claims about agave nectar. At the beginning of the article it states, “However, as is so often the case, when the product is processed and refined it tends to lose some (or all) of these beneficial health effects. This appears to be the case with the refined Agave sweetener that people are consuming today.”. I think the whole crux of the argument isn’t whether or not agave contains fructose, but how refined the nectar is. My reading of the response from groovy foods is that their nectar isn’t highly refined. I’m not a chemist and have no idea whether of not hydrolysis comprises high refinement, but if it doesn’t then I would expect Groovy Foods agave nectar to be fine to consume in moderate quantities.